Coloring Contest ends and Scholastic Book Fair begins! The Scholastic Book Fair begins on May 25 and runs until June 6. It is the perfect place to purchase books for summer reading. Mysteries, sci-fi, fantasy and lots of funny books will fill the tables. Is someone’s birthday coming up? Invite them out for lunch and swing by the library for a side order of something yummy to read. And while you are at the library take a few moments to enjoy the work of our young artists, ages 3 to 18, who participated in our first Coloring Contest. The four winners receive $15 to spend at the Scholastic Book Fair. Melissa Barker, Murphy Library’s assistant librarian shows off the work of a few of the 80 (so far) Coloring Contest participants. The contest offers prizes for and coincides with the Scholastic Book Fair running through June 6 at the library. Call 837-2417. Blakely Snyder visited the Murphy Library recently with her mother, Destiny. They live in Cherokee County and Blakely is glad they do. Now she will be able to go to the Scholastic Book Fair at the Murphy Library starting today, November 18, and running through Tuesday, December 1. The three-month old knows it will take her a few months to learn to read, but she is hoping her mom will start reading to her so she can hear the sound of the words. Easy reader, picture books and funny stories are all waiting for book lovers like Blakely, not to mention mysteries, fantasy and history books. Now is the perfect time to go holiday shopping for young readers, teen readers and all readers who want to learn something new. And what holiday are you shopping for? If you have a young reader in your family discovering the lure of stories, every day is a holiday! Call the library at 837-2417 for details, or better yet, drop by the library and find a hidden treasure to give to a young reader. The Scholastic Book Fair ends this Tuesday, June 3. There is still time to buy a favorite child a special storybook or buy your teenager an adventure story they will never forget. While the kids are browsing, you can check out the cookbooks and adventure stories yourself. Nantahala Library Youth Services librarian Bridget Wilson encourages young people to read during Story Time hours at the Murphy Public Library. Recently she brought out two books parents may want to add to their children’s bookshelf during the Scholastic Book Fair that begins at the library today. One is Ever After High, a story about the lives of dolls by Shannon Hale, for 9 to 12 year olds. Miss Bridget also recommends Pirates Love Underpants with the emphatic statement, “They do and they should.” The humorous book is by Claire Freeman and Ben Cort. The Scholastic Book Fair runs from May 21 to June 3. This is the perfect time to buy funny and even serious books for your children, grandchildren or maybe something for yourself. You never know what you will find at the book fair. Call 837-2417 for details. Scholastic Book Fair at Murphy Public Library runs Oct. 23 to Nov. 4 — now is the time to buy a child or teen or yourself a book to cherish. Murphy librarians Melissa Barker and Jeff Murphy show off the trophies they won at the Cherokee County Chili Cook-off. They are now running the Scholastic Book Fair through November 4. Call 837-2417. 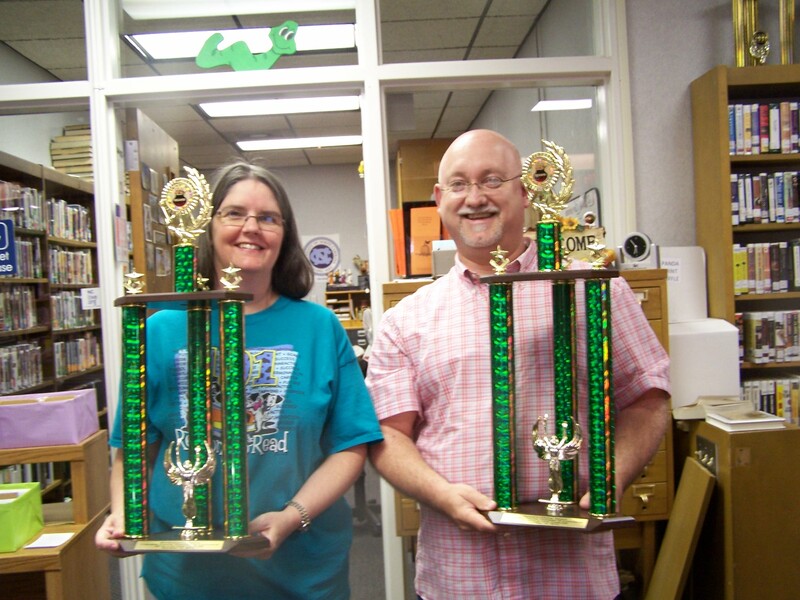 Librarians Jeff Murphy and Melissa Barker were all smiles at the Murphy Public Library last week as they showed off their trophies. 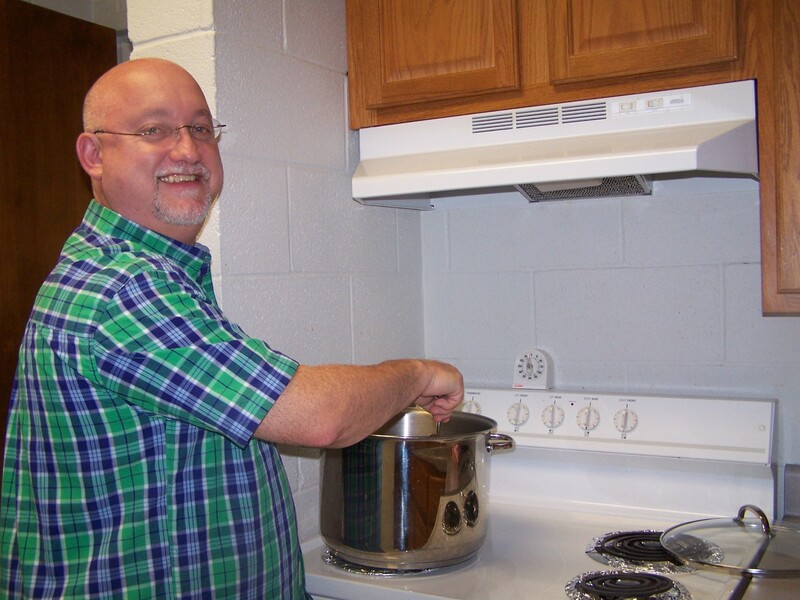 They and their staff had won two awards at the 18th annual Cherokee County Chili Cook-off on October 12. One was for Showmanship and the other was the People’s Choice award. However, these chili cooks who also love books, are not taking it easy. They have a Scholastic Book Fair opening today, October 23 and running until November 4. The fall Scholastic Book Fair is the best time to look for Christmas and holiday gifts for children, teens and even adults. Mysteries, sci-fi, fantasy and lots of funny books line the tables at the library. The stocking stuffers of writing pens, word pointers and bookmarks may also bring smiles, just like the chili trophies brought smiles to the staff at the library. Next week Oliver Sullivan will celebrate his second birthday. He and his mother Amanda have just discovered that his birthday coincides with the Scholastic Book Fair at the Murphy Public Library. Maybe a new book is in order for the birthday boy! The Scholastic Book Fair will run from May 23 to June 4. This is the perfect time to buy books for your children, grandchildren or maybe something for yourself. You never know what you will find at the book fair. Call 837-2417. 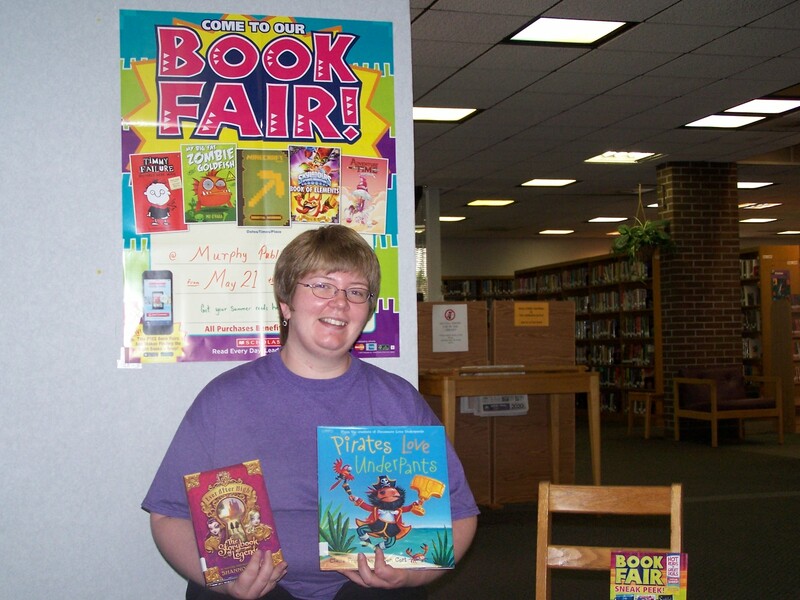 The Scholastic Book Fair takes place at the Murphy Public Library from May 23 to June 4. 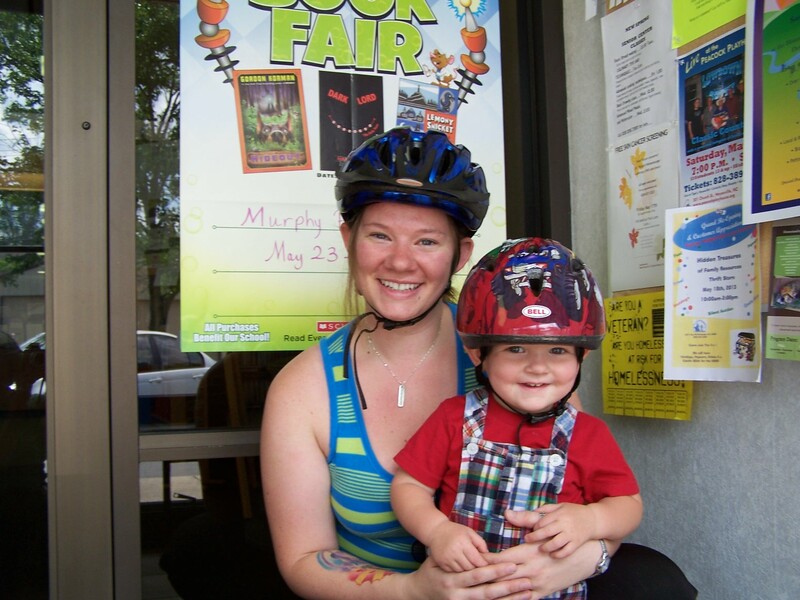 Murphy residents Amanda Sullivan and her son Oliver often come by bicycle and are sure to visit the library to see what treats Scholastic has in store this year. Call 837-2417. Amanda and Oliver live in Murphy and often visit the library, she on her bicycle and he in his bicycle trailer. Like many parents in the Murphy area, she understands the importance of introducing a child to a library and its books at a young age.